Did you know that Budapest has three airport terminals? Yep, three separate airport terminals and not right next to each other: T1 is about 5 min from T2A and 2B – so Terminal 1 and Terminals 2 A and B are not just a short walk from each other. 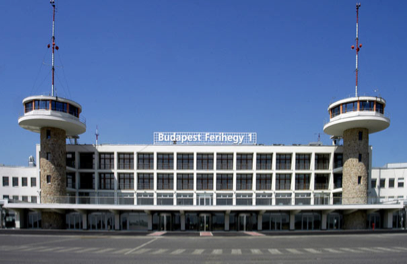 From May 30, 2012 all airport traffic in Budapest is managed at T2 (i.e. at T2A and T2B terminals) while T1 is closed down (at least temporarily, until the financial problems of the Hungarian airline company are sorted out in one way or another – Malev collapsed in Feb 2012). That means that if you plan to take the train to the city from the airport in Budapest (to Nyugati Train Station), you will need to take a short bus trip first to the train station from T2, as the Budapest Airport train station was built next to T1. Sorry. Budapest Airport is about 10 miles (16 km) from the city center of Budapest, so it is about a 35 minute drive from your downtown accommodation. Depending on the traffic, the trip to the airport may take 20-50 minutes. It is a safer bet to count on higher traffic in Budapest all week long in the daily hours, while between 9pm and 5am the city is more relaxed. Flights in Budapest are very rarely diverted due to rough weather conditions (there are 4 seasons in Hungary, but the weather, winds, storms are not really in the extremes). If a Budapest flight should happen to be diverted, the two closest international airports are in Bratislava (Slovakia) and in Vienna (Austria). Ferihegy T2A (terminal 2A) is typically used for flights that go to a European Union country, i.e. flights with a Schengen destination, Malev flights (the Hungarian flight company, which went bankrupt in Feb 2012) and in general Schengen flights: Air Berlin, Air France, Austrian Airlines, Brussels Airlines, Czech Airlines, Lufthansa, SAS Scandinavian Airlines, Smart Wings, Swiss International Air Lines, TAP Portugal, LOT Polish Airlines, Finnair, Air Malta. Ferihegy T2A is in walking distance to Ferihegy T2B. Ferihegy T2B (terminal 2B)is used for flights that do not go to a European Union country, i.e. the non-Schengen flights, e.g. Delta AirLines (NY JFK), British Airways (London Heathrow), Aeroflot (Moscow), Aer Lingus, Egypt Air, Sky Georgia, SmartWings, Moldovian Airlines, El Al, etc. etc. Ferihegy T2B is in walking distance to Ferihegy T2A. Ferihegy 1: T1 (terminal 1) is shut from 30 May. When it is resumed again, it will usually serve cheap discount flights (RyanAir, EasyJet, WizzAir, Norwegian Air Shuttle, Germanwings, JET2, etc.). T1 and T 2A / 2B terminals are approx. 5 min distance form each other by car, so make sure you know where your plane will take off. In addition to the Budapest international airport, which serves about 7-10 million passengers a year (Europe, North America, Asia, Middle East, Africa), there are 4 more international airports in Hungary. If you take a taxi in Budapest, the trip from one airport terminal (Budapest Liszt Ferenc International Airport Terminal 1) may take about 5 min to the other airport terminal (Budapest Liszt Ferenc International Airport 2A and 2B). But until T1 is closed down it is not an issue. So if T1 is resumed again, it is not enough to plan your trip to Budapest airport, you also need to check which terminal you will use: T1 or T2? The taxi driver will ask you anyway when you get in the car.